Grand Lodge of NJ – Host Lodge #6 F. & A.M. Host Lodge #6 is a subordinate Lodge of the Grand Lodge of New Jersey, headquartered in Trenton, New Jersey. Most Worshipful Dieter B. Hees is the Grand Master of Masons for the State of New Jersey. 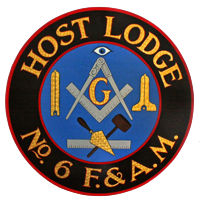 Host Lodge is a member lodge in the 14th Masonic District. Right Worshipful Bradley K. Horn is the District Deputy Grand Master for the 14th Masonic District. Right Worshipful Elmer N. Hutchison is the District Ritual Instructor for the 14th Masonic District.